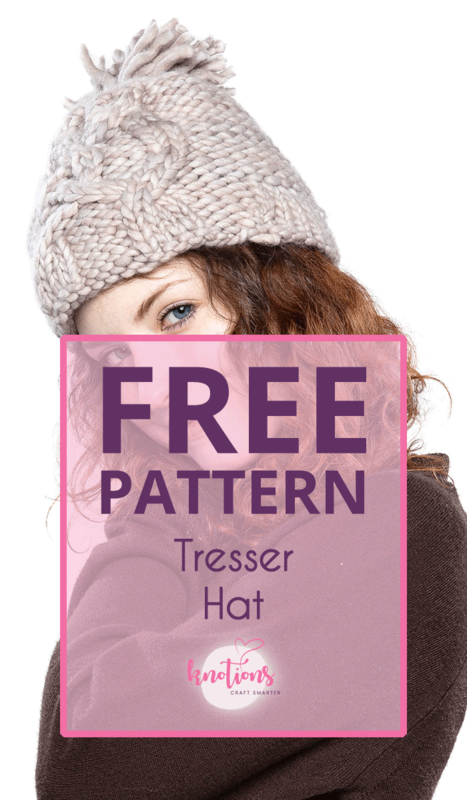 Tresser is a unisex, super-bulky hat featuring the Saxon braid cable stitch pattern. 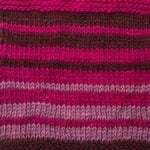 This design is intended to be a quick knit suitable for gifts, whether for Christmas, New Year’s or Valentine’s Day. 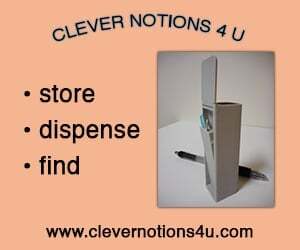 20” [51 cm] circumference (unstretched) and 8” [20.5 cm] high. Malabrigo Rasta (100% merino wool; 90 yards [82 meters]/150 grams): Whole Grain, 1 ball. The sample used 60 yards [55 meters]/100 grams. 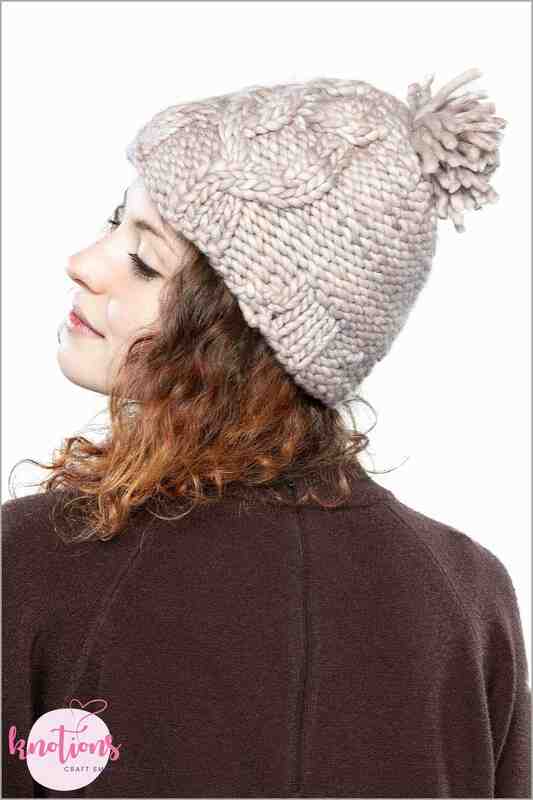 Thanks to Malabrigo for providing the yarn for this hat! Size US 13 (9 mm): 24” circular or size needed to obtain gauge. Removable stitch markers; tapestry needle or crochet hook for weaving in ends; cable needle (optional). 10 sts and 14 rnds = 4” [10 cm] in St st.
2/2 LC (2/2 left cross cable): Sl 2 sts to cn and hold in front, k2, then k2 from cn. 2/2 RC (2/2 right cross cable): Sl 2 sts to cn and hold in back, k2, then k2 from cn. 2/1 LPC (2/1 left purl cross cable): Sl 2 sts to cn and hold in front, p1, then k2 from cn. 2/1 RPC (2/1 right purl cross cable): Sl 1 st to cn and hold in back, k2, then p1 from cn. 2/2 LPC (2/2 left purl cross cable): Sl 2 sts to cn and hold in front, p2, then k2 from cn. 2/2 RPC (2/2 right purl cross cable): Sl 2 sts to cn and hold in back, k2, then p2 from cn. 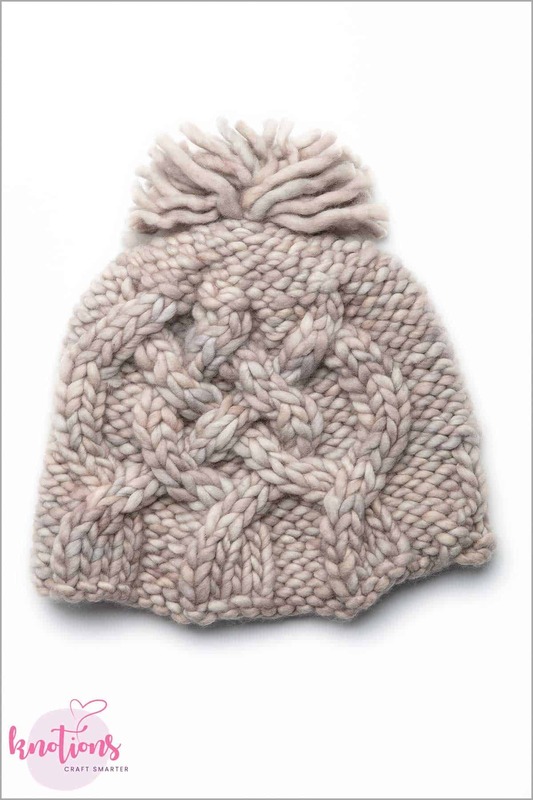 The hat is knit bottom-up in the round, beginning with a ribbed border. 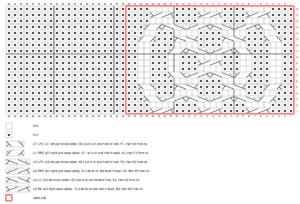 The cable pattern is both written and charted. 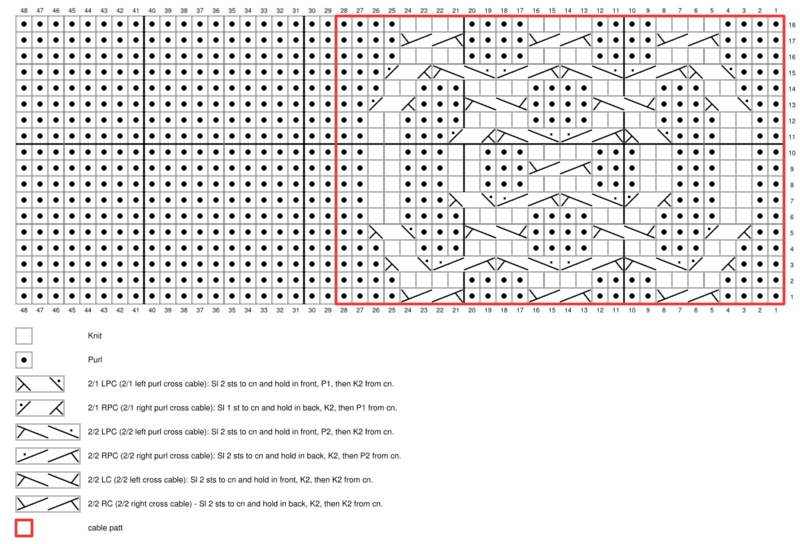 Work the chart Rnds [1-18] once and then proceed to Crown Shaping. The 28-st cable patt is marked within red lines and is worked just once between the BOR and cable end markers. Bolded black lines indicate blocks of 10 sts and rnds. CO 48 sts using long tail CO. Join in the rnd and place a BOR marker. Rnds 1-8: *P4, k4; rep from * to end of rnd. 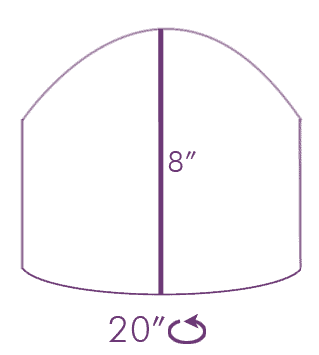 Work Rnds [1-18] once from chart or written instructions below, then proceed to the Crown Shaping section. 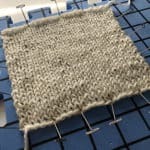 In the first rnd, work the cable pattern, place a marker (pm) at the end of the cable section, and then purl to end of rnd. In the subsequent rnds, work the corresponding cable rnd, slip the marker (sm) and purl to the BOR marker. Remove cable marker, leaving the BOR marker as is. Rnds 1, 2, 4, 6, & 8: P.
Rnd 3: *P2tog; rep from * to end of rnd (24 sts decreased, 24 sts rem). Rnd 5: *P2tog, p1; rep from * to end of rnd (8 sts decreased, 16 sts rem). Rnd 7: *P2tog; rep from * to end of rnd (8 sts decreased, 8 sts rem). Remove BOR marker. 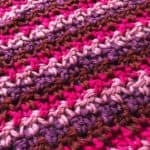 Pull yarn through the remaining sts and cut yarn. 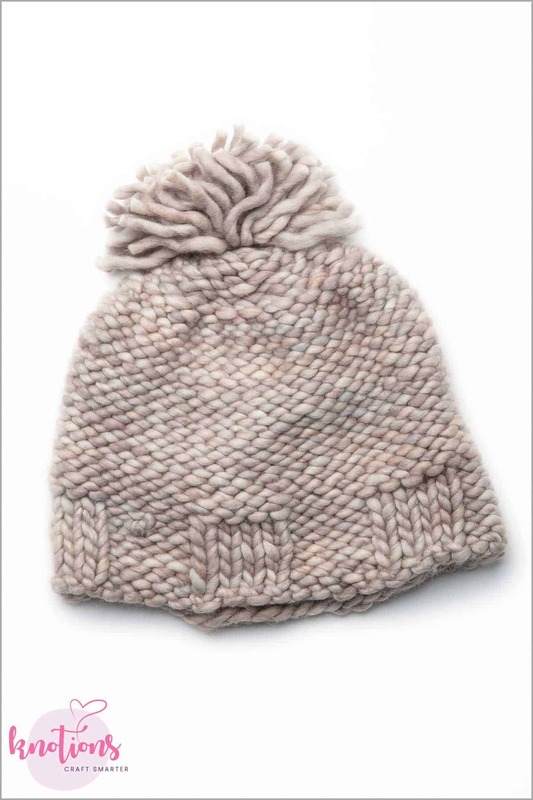 Weave in ends and add a pompom if desired. Rnd 1: P4, (2/2RC, p4) 3 times, pm, p to end of rnd. Rnd 2: P4, (k4, p4) 3 times, sm, p to end of rnd. Rnd 3: P3, 2/1RPC, (2/2LPC, 2/2RPC) twice, 2/1LPC, p3, sm, p to end of rnd. Rnd 4: P3, k2, p3, k4, p4, k4, p3, k2, p3, sm, p to end of rnd. Rnd 5: P2, 2/1RPC, p3, 2/2LC, p4, 2/2LC, p3, 2/1LPC, p2, sm, p to end of rnd. Rnd 6: P2, k2, (p4, k4) twice, p4, k2, p2, sm, p to end of rnd. Rnd 7: P2, k2, p3, 2/1RPC, 2/2LPC, 2/2RPC, 2/1LPC, p3, k2, p2, sm, p to end of rnd. Rnd 8: P2, (k2, p3) twice, k4, (p3, k2) twice, p2, sm, p to end of rnd. Rnd 9: P2, (k2, p3) twice, 2/2RC, (p3, k2) twice, p2, sm, p to end of rnd. Rnd 10: P2, (k2, p3) twice, k4, (p3, k2) twice, p2, sm, p to end of rnd. Rnd 11: P2, k2, p3, 2/1LPC, 2/2RPC, 2/2LPC, 2/1RPC, p3, k2, p2, sm, p to end of rnd. Rnd 12: P2, k2, (p4, k4) twice, p4, k2, p2, sm, p to end of rnd. Rnd 13: P2, 2/1LPC, p3, 2/2LC, p4, 2/2LC, p3, 2/1RPC, p2, sm, p to end of rnd. Rnd 14: P3, k2, p3, k4, p4, k4, p3, k2, p3, sm, p to end of rnd. Rnd 15: P3, 2/1LPC, (2/2RPC, 2/2LPC) twice, 2/1RPC, p3, sm, p to end of rnd. Rnd 16: Rep Rnd 2. Rnds 17 & 18: Rep Rnds 1 & 2.